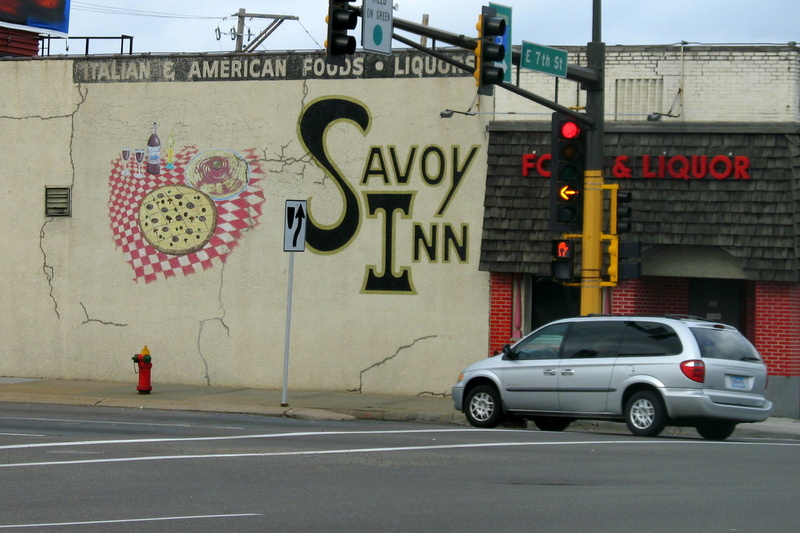 For as long as I can remember, Savoy Inn has stood in this location on Seventh Street and the end of the Lafayette Bridge in St Paul. I've heard so many good things about this place, they must be doing something right because they are still there year after year. Yet, I have never paid a visit to this restaurant. The longer I post photos of the Twin Cities, the more I realize there are many things I have not tried, been to, stopped at, in my very own neighborhood. This photo reminds me of a soul food restaurant near my mother's in Tacoma that I've always wanted to try, and I think on my next visit I will! It too has been there "forever." This has been one of my family's absolute faves over the years. My mother and her sisters pick one up to go most Sunday afternoons & my father and his tennis buddies go weekday evenings and stay a while. Parking is tough and it is a bit of a dive, but the pizzas are *loaded* with toppings and just a touch spicy (for pizza). I refer to them as "juicy pizza". You gotta have it at a least once. Personally, I am a Carbone's girl... something special about all that greasy goodness... and the W. St. Paul location has fresh garlic on the menu... delicioso! I'm gonna attempt to be gentle here, but my experience at Savoys was so pathetic that we now refer to it only as "Red f-ing Savoys" Pizza. We use it as slang to refer to something really bad. We found the place to definetly be a dive, as amy says above, but we've been to many of those and the food makes up for it. But in this case the sauce and crust were worse than a frozen pizza. While the toppings were plentiful, we couldnt get past the flavors of the sauce and crust. Maybe we didnt have as much alcohol in us as the rest of the patrons who seemed to enjoy their pizza, but we were serverly disappointed with ours. Plus pretty bad service. Yesterday we got to eat one of our all-time fave St.Paul pizza places--Cosseta's. Now THAT is pizza!! Have you tried that yet? Cossetta's was were I took my wife on our first date. I've been going to Cossetta's since age...17 or so at their old location. It too is my all time favorite pizza place in St Paul. I would guess why I've never been to Savoy's would be the location it is at.